2017 Anthony Award Winner — Best Novella! Nine years later, Cathy again stood in the kitchen—not the kitchen of their apartment in Newton Upper Falls or of their house in Virginia, but of their condominium in Brookline. Once again, Mrs. Morrell and Will, and Faye and Brian, had come to dinner. But Frank was dead now, supposedly in an accident. Really, Cathy thought, it had been suicide by car, suicide by alcohol. Really, it had been murder. In “The Last Blue Glass,” a young widow takes revenge on the person she sees as most responsible for her husband’s death. As she prepares dinner for four guests, she thinks back on the history of her marriage, on the roles those four guests played in it, on the effects their words and actions had on her sensitive, vulnerable husband. The challenge to the reader is to figure out which of the four she’s chosen as her target. The story appeared in the April, 2016 Alfred Hitchcock Mystery Magazine. I love the illustration. It captures, I think, the joy Frank found in performing. And it helps us understand why Cathy resolved to do the only thing she could do to bring him the only sort of justice she could manage. Published in Alfred Hitchcock Mystery Magazine. 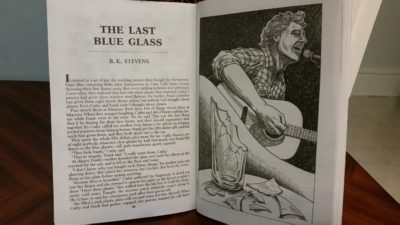 “The Last Blue Glass” was nominated for Agatha and Derringer awards and is now an Anthony Award winner for Best Novella.